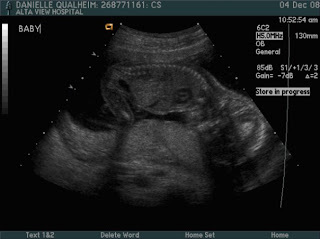 Bev's Country Cottage Blog: Ultrasound!! Wow- I should have put on my reading glasses as I mis-labeled the last ultrasound I posted! That one was my adorable grandson Jackson, as someone pointed out to me. So here is Owen's ultrasound. You can see his little spinal cord, and legs, and his head is on the right. Those little Qualheims all kinda look the same at that age!! :) I love my grandbabies so, so much! What a precious gift from God. I have been working on printing out signs for the Humanitarian Booth, and since I had part of today off work, Danielle (my son Christopher's wife) and I have been rearranging the living room ready for her baby shower tomorrow. We actually got the exercise bike out here and Patti's orange recliner, which I put next to mine. She has an important basketball game tonight that will determine if they go to the finals. I hope they win. Those Mustangs have really worked hard this year. Here is a yummy recipe I want to share with you today. My mum used to make this all the time and she made enough to freeze one for another day. So good! Cook spaghetti in boiling salted water until just tender. Drain. Brown hamburger, add green pepper and onion. Cook until soft. Combine cooked spaghetti, meat mixture, and remaining ingredients in a large bowl and mix well. Turn into 2 large greased casseroles, freeze one casserole for later and bake the other at 350 degrees for about 1 hour. Material specifications: No. 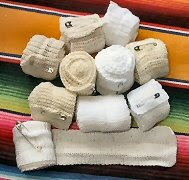 10 knit Cro-sheen, 100% mercerized cotton in white, cream or ecru. It's bedspread cotton, thin. *When completed, roll bandages and secure with a large (2") safety pin. *Put in plastic bag, remove air, and seal. Use size 2 knitting needles if you knit average or loosely, size 3 needles if you knit tightly. Cast on 24 to 27 stitches so the bandage measures 3"- 4" across. Knit every row until bandage is desired length of about 4 feet long, then bind off, leaving a 2-3" tail to weave in. (TIP: I find the edge looks neater if I slip the first stitch of each row instead of knitting it.) Secure tail by slipping thread through last stitch, tying a small knot, and weaving end back through stitches. Use size D or E crochet hook (loose tension desirable). Chain enough stitches (23-26) to measure 3" - 4" in width. Row 3 - ? (4 feet long) Repeat row 2 until bandage measures about 4' long. Finish off by pulling thread through last loop and secure with a knot. Weave end back through stitches. I use a sewing needle to do this. I am going to have a spot at the Clark County Fair humanitarian booth for this information- hoping many more people will take a pattern and start some bandages too. HUG the ones you love and remember that Jesus Christ loves you so very much and any problems you have, He knows how to solve them. Don't you have a son on a mission? how is he doing? Aren't ultrasounds of the babies wonderful? I got to see my last grandchild at 7 months--bonded with him before he was even born. I wish we had those back in the old days. Elder Qualheim is doing fine on his mission. He is serving in Watertown SD currently. Timmy is a man of few words so we don't hear much about the mission per se. I ask him questions and he answers with a couple of words! His testimony is growing as he has had some health issues and trial either grows the testimony or you push your testimony away. I am thankful he is embracing his testimony all the more through trial. glow when the element burned up!